Motorbike racing is to return to the Oliver's Mount road circuit 17 months after 12 people were injured in two crashes. The venue has attracted thousands of spectators to the 3.8km (2.4-mile) track in Scarborough, North Yorkshire. However, racing has not taken place on the roads since competitors crashed through fencing at an event in September 2017. Two meetings will take place in July and September, it has been announced. Events at the circuit had previously been run by the Auto66 Club, but now a newly-formed motorcycle racing club, Two Four Three Road Racing Association, will be in charge of the races. Scarborough Borough Council has granted a lease of the site to GrantRoberts Ltd, operating as the racing club and headed by two former Isle of Man TT racers Eddie Roberts and Mick Grant. Mr Grant has won the Isle of Man event seven times. The operators said races and safety improvements for both riders and spectators along the Scarborough route had been "months and months in the planning". The two meetings will be the Barry Sheen Classic on 27-28 July and the Gold Cup from 27-29 September. Mr Roberts said: "We are working side-by-side with the ACU (Auto Cycle Union) and work is already under way to improve the safety of the track for both for riders and spectators." The council estimated racing events at the circuit brought in about £1.4m each year to the town's economy. Mr Grant added: "We couldn't let this historic track crumble into the history books. "We need road racing in England - it's one of the finest tracks in the world and it's unique." 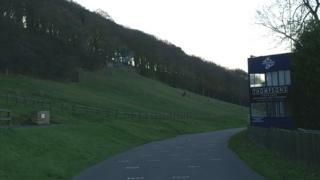 Oliver's Mount is the only natural road race circuit in England, just outside Scarborough town centre.